We are a small family run building firm who have been established for over 60 years. We are one of the few remaining companies from the 1950's still working in then local area. We provide a friendly and reliable service. We pride ourselves on our workmanship and always listen carefully to our customers. The business was founded by Basil High. Basil first started work at 14 as a printer's apprentice, before joining the Navy in 1943 and taking part in the Normandy landings. When he returned to Britain, he worked as a carpenter's apprentice for his father, before starting his own firm. 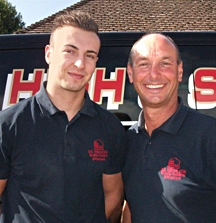 Bail's legacy continues and the business is now run by his son Martin and grandson Oliver. We specialise in kitchens, bathrooms and wet rooms, and are particularly aware of designing in disabled facilities when required. We also offer a complete range of building services, and no job is too small. All the work we do is fully guaranteed.